Sympathetically restored to a good standard, this property is ready to move into as a . . . Traditional stone longere with bags of charm, nestled at the end of a lane, with attached . . . 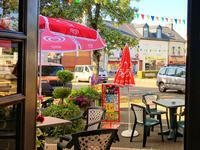 This is a fantastic property with huge scope for chambre d'hotes, gite business and/or . . . UNDER OFFER - Completely private situated in beautiful countryside at the end of a lane with . . . This established bar, with snack facilities, a terrace, and a games room, is in the centre of . . . UNDER OFFER Once the school house, this property retains many of the original features and . . . This detached two-bedroom house would make a great holiday home, and its location makes it . . . In a peaceful and private setting, somewhere to really get away from it all! This property . . . This imposing, ready-to-move-into stone house has been sympathetically decorated throughout, . . .
An ideal lock up and leave 2-bed holiday home with rental possibility as a gite, in a village location. This sweet little village house is perfect for a holiday home and is within walking distance . . .
An ideal family home or a perfect lock-up-and leave holiday home, with enclosed courtyard and . . .